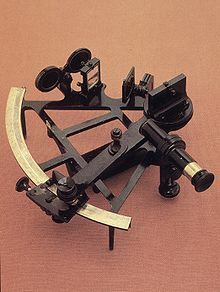 A sextant is an object used for navigation which measures angles. The user is able to measure the angle between the horizon and an object in the sky, such as the sun, a star, or a planet. It originally could measure angles up to 60°, which was one sixth of a circle. This is how it got its name from the Latin word sextus (six). It helps work out positions of latitude and longitude. ↑ "Sextant from". McGraw-Hill Concise Encyclopedia of Science and Technology. 2006. Retrieved 16 June 2011. This page was last changed on 29 January 2015, at 20:14.